Bulgarian MPs have voted to accept the resignation of Prime Minister Boiko Borisov and his government. The vote opens the way for an early election, now expected in April rather than the scheduled July. Mr Borisov's surprise resignation followed nationwide street protests against high electricity prices and austerity measures. On Tuesday clashes between protesters and police left at least 14 people injured. The government's resignation was accepted in a 209-5 vote. President Rosen Plevneliev will now try to appoint an interim cabinet, to take the country through to early elections. A crowd of supporters chanted their approval of Mr Borisov as he left the parliament building - a stark contrast to the anger of the streets during the past 10 days, says the BBC's Nick Thorpe in Sofia. But Bulgarian commentators largely agree that his departure deepens rather than solves the crisis, our correspondent says. The protesters have accused the whole political class of being corrupt and inefficient, not just Mr Borisov's party. The surprise resignation of Boiko Borisov and his GERB (Citizens for the European Development of Bulgaria) cabinet leaves Bulgaria in turmoil. Mr Borisov has made clear that he and his party will not take part in an interim administration. GERB were trailing in polls to the opposition Bulgarian Socialist Party even before the current unrest. One interesting aspect of the protests is that they are taking place largely independently of traditional political parties and trade unions. The core of the protesters are young people, organising via social media sites such as Facebook. The immediate concern in Bulgaria is stability. Many parallels are being drawn with 1997, when the socialist administration was brought down by street protests. Some commentators said Mr Borisov's resignation may have been designed to save too much damage to the ruling party. The street protests across Bulgaria, which is the EU's poorest country, were initially over high electricity prices but soon took an anti-government turn. The prime minister tried to calm the protests on Tuesday by promising to slash prices and by sacking his finance minister. He also pledged to punish foreign-owned power companies that he said charged too much. 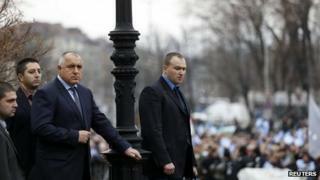 But our correspondent says that the clashes on Tuesday were the last straw for Mr Borisov. The government lost support after it abandoned plans in March 2012 to build a new nuclear power station at Belene, close to the Romanian border. A controversial referendum last month on whether to build a second nuclear power plant was invalidated by a low turnout, although more than 60% of those who voted backed the idea. Correspondents say that while budget cuts have felled a series of governments around Europe, Mr Borisov - a former bodyguard to Bulgaria's Soviet-era dictator Todor Zhivkov - had until recent weeks seemed relatively immune.